Chana dal is a high protein, log GI pulse that is produced by splitting and polishing infant chickpeas. It is widely available around the world, and is even making its mark in the organic market. I made this dish a lot while I was pregnant with my first child as I went off meat completely, and had very low iron. This was the perfect dish to boost my levels, and tasted delicious! 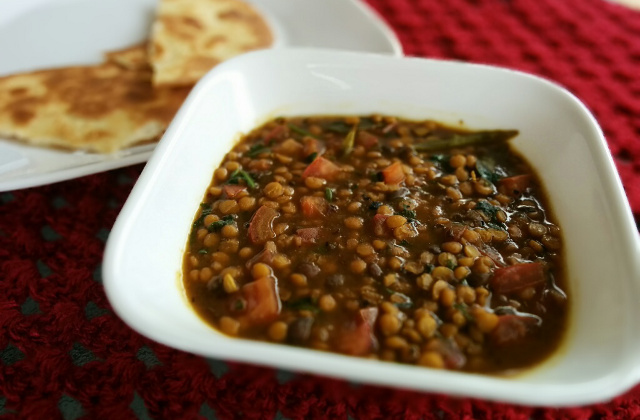 Firstly, soak the chana dal in a large bowl with a tablespoon of salt and lots of hot water. Leave to soak for 8-12 hours. Soaking the dal makes it easier to cook without pressure, and also releases toxins from the dal into the water. Drain the water and rinse the dal thoroughly (important). 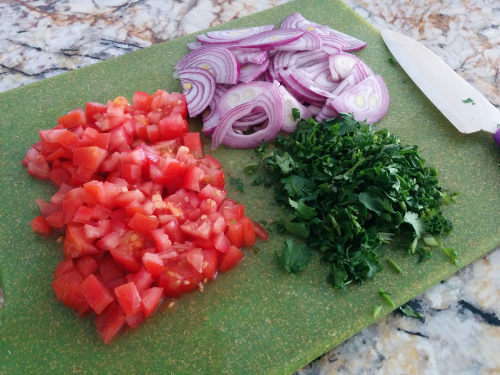 After the dal is rinsed, thinly slice the onion in half rings, finely chop the coriander, and finely dice the tomatoes. Fry the onion in the coconut oil / ghee for 5-8 minutes on medium heat in a large pot, or until golden brown. 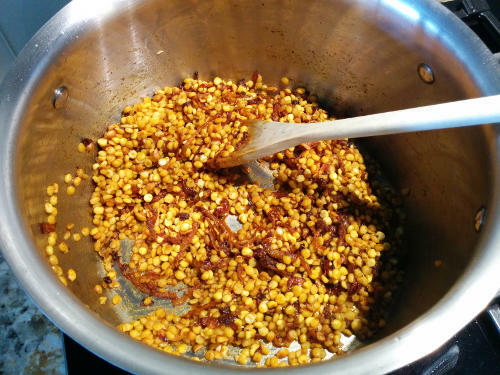 Add your masalas, garlic and ginger paste, mustard seeds, curry leaves and optional chilli. Fry for 2 minutes until fragrant, then add the drained dal and mix. Add in 2L of boiling water, add the salt, bring to the boil and reduce heat to low to simmer for 50 minutes, covered. Remove the lid to reduce the water for 10 minutes or so. 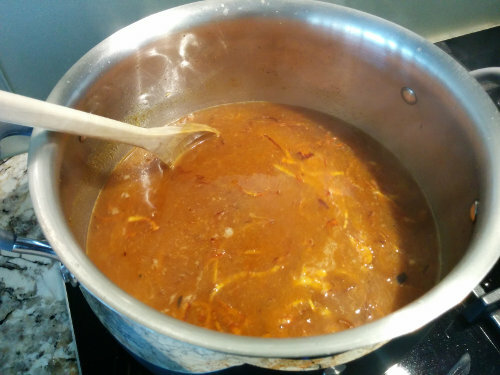 The dal should be firm yet soft, and water should be reduced so dal mixture is thick. It is not recommended you eat raw dal, so if the dal is not quite there and still crunchy, add a bit more boiling water and cook for an extra 5-10 minutes. One can also pressure cook the dal if you are running short on time. In that case, simply add the water and pressure cook for 2 whistles and about 10 minutes on slow. Once the dal is soft, add in the tomato and coriander, stir to combine, shut the heat and cover with lid to let the flavours infuse. Serve hot with chapatti or parathas (or rice, if you’re a crazy Parsi like me!). 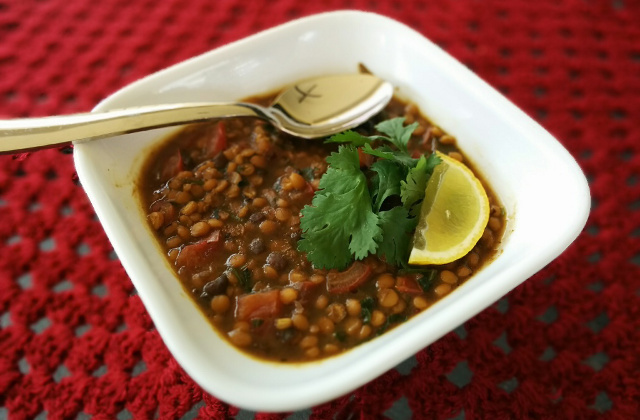 I simply can’t wait to try this chana dal recipe….yummy! !